Frederick, MD - Enjoy the 26th annual Candlelight Tour of Historic Houses of Worship this holiday season in Downtown Frederick. This special open house celebrates Frederick’s tradition of religious diversity, local history, and the holiday season on Wednesday, December 26 from 4-9 p.m. As the sun begins to set, visitors can tour many of Frederick’s famous clustered spires and other historic houses of worship by candlelight. At nearly a dozen sites, guests will be welcomed with special programs, angelic choirs, and nativity scenes. During the tour, visitors experience three centuries of American architecture and history, providing the perfect setting for joyful celebrations and camaraderie. “It’s a great event that families can share with their out of town guests during the holidays” says Robyn Hildebrand, Visitor Services Manager for the Frederick Visitor Center and event coordinator. “It’s an evening of beauty, history and entertainment, an ideal night out for everyone,” she added. Eight of the participating congregations were active during the Civil War. Church spires that highlight the Frederick skyline have become a symbol of Frederick’s distinguished heritage and beauty. Frederick’s iconic clustered spires are immortalized in John Greenleaf Whittier’s Civil War-era poem, Barbara Frietchie. “The clustered spires of Frederick stand, green walled by the hills of Maryland,” he wrote. The tour concept was developed by Peter Plamondon, Sr., founder of Plamondon Companies 26 years ago. Bert Anderson, developer of Everedy Square and Shab Row, has also been a strong supporter of the program. The program has grown over the years, and today visitors enjoy tours, interpretations, and seasonal music performed by vocalists, piano, organ or instrumentalists - with some sites offering complimentary beverages and light refreshments. Congregational members act as hosts to greet visitors and answer questions about the history of the churches. Outside, luminaries guide visitors from one site to the next. Hospitality rooms and refreshments will be offered at All Saints Episcopal Church- 106 W. Church St.; Calvary United Methodist Church- N. Bentz and W 2nd St.; Frederick Presbyterian Church- 115 W. 2nd St.; Grace United Church of Christ- 25 E. 2nd St.; Saint John the Evangelist Catholic Church- 118 E. 2nd St.; and Evangelical Lutheran Church-35 E. Church St. Public Restrooms are also available at select sites on the tour. Visitors can find convenient parking in the Church Street Garage, Carroll Creek Garage, West Patrick Street Garage, or street parking. This year’s tour is coordinated by the Tourism Council of Frederick County and sponsored by the Everedy Square & Shab Row Shopping Complex, The Plamondon Companies, Frederick County Bank, and The Gazette. For more information please visit www.visitfrederick.org , contact the Frederick Visitor Center at 1-800-999-3613, 301-600-4047, or email tourism@fredco-md.net. 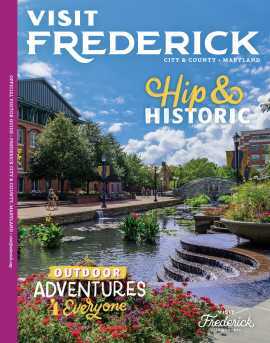 For your free copy of a tour brochure, including a map, stop by the Frederick Visitor Center (151 S. East Street, Frederick, MD), participating church sites or local Roy Rogers Restaurants, and sponsor locations. Brochures are also available between 3-9pm the day of the tour at the Church Tour Information Center, 19 E. Church Street, Frederick. For more information about other things to see and do in Frederick County and a complete listing of events, visit www.visitfrederick.org.